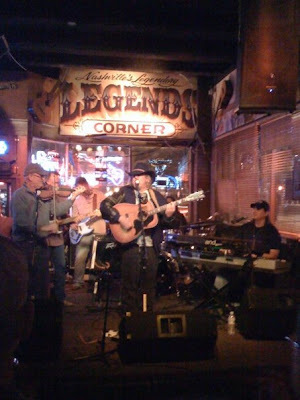 John Rich and John Anderson Sit In With Dave Parks At Legends Corner! This past Tuesday at Legends Corner had a surprising end to the show. John Rich and John Anderson showed up to hang out for a bit. John Rich got up and introduced John Anderson to let him sing two of his greatest hits. Seminole Wind and Just A Swingin'!!! Got to talk with John Rich and James Stroud (Big Time Music Row Producer) while John Anderson was singing. Really fun! This coming Tuesday we are going to have a video Director/Producer for the show so hopefully the quality and entertainment value of the show online will be higher! Be right here at 7pm every Tuesday! Below is a clip of John Rich introducing John Anderson at my show! A while back Chase Foster and I were hangin' out tradin' songs and he happened to have a little recorder with him so we recorded a little guitar/vocal of a song my Dad (Randy Parks) and I wrote called Whatever's Gonna Come. Chase put a cool little acoustic part on it. I love the song and hope to record it soon. It's just a "one take" live recording of Chase on guitar and me singin' but I thought you might like to hear the kinda stuff we are working on. So if you would like to download the song right click and choose "Save Target As" here! Don't forget you can watch us over the internet at Legends Corner every Tuesday night starting a 7pm. Just go to daveparksmusic.com! Wow what a Super Bowl!!! Congrats to all the Steelers fans. Ken Greene! I know your gonna sleep well tonight. Hope your weekend was a great one! Wanted to let you know that we will be broadcasting live video from downtown Nashville at Legends Corner on this very web site Tuesday Feb 3 starting at 7pm! And every week there after! Last week we tried out the broadcast kinda at the last minute and it was a wild success so we can't wait to bring our style of country music straight to your computer! The video quality is not the greatest but we are working on that. The audio sounds great so we think you'll have a great time joining us! I also wanted to mention something about social networking. Facebook… have you heard of it? I figure by now most people have. It is really taking over. It passed MySpace last month for unique hits and it is on track to pass Blogger (the service I use for my web site) and become the #1 web site in the world. If you don’t have a Facebook account you should get one. It is much more private than MySpace, pretty simple to manage and a lot of fun to connect with friends including your old friend Dave Parks! If you already have a Facebook and your not my friend please do that here! I also have an artist Facebook page so you can become my fan here! Thanks again for all your support. I am so excited to be able to bring you content every week. Hope you enjoy!! !